The frigid air, the ominous smell of coffee when walking by any city corner, languages so foreign they make even a native New Yorker feel out of place – must be winter in New York! Thousands of tourists flood into the already 10th most populated city in the world each winter to experience the amazing events and atmosphere New York City has to offer. I know, I know New Yorkers, but we must co-exist! Besides, if you stay out of Manhattan there’s a 70/30 chance you won’t run into tourists this holiday season anyway, but what’s in Manhattan, right? Welcome to your theatre mecca! From Broadway to the Burroughs New York City has great theatre options for your winter visit. Radio City Christmas Spectactular – This classic show features the iconic Rockettes line kicking their way into the New Year. Buyer and Cellar – This one man show about being an employee in Barbara Streisand’s basement that more-so remsembles a private mall has been getting stellar reviews from all the top critics in NYC. Treat yourself to this amazing off-Broadway gem. A real treat for all the Babs fans out there. Matilda – Roald Dohl’s book comes to life onstage at the Shubert theatre. Winner of Tony, Drama Desk, Olivier awards; this spectacle-filled, family show is the top show to see on Broadway, and it’s pretty affordable by NYC theatre standards. You know the city theatre scene. You don’t stand in line for student rush tickets. You may venture to the TKTS booth if you really, really NEED to see a show, but most likely you are exploring theatre other than those glittering marques on Broadway. How I learned What I Learned – You’ve seen your buddies one man show above the pizza place in Hell’s Kitchen; This is not that one man show. Take a journey with Sinagtrue Theatre’s stand on August Wilson’s work. TOO MUCH LIGHT MAKES THE BABY GO BLIND – This truly unique, one-0f-a-kind show piars improve and script sketches in a show that the audience dictates the flow and feeling of the night. Very fun, very New York. iLuminate – You know when you wished the future was now? It is. Just go see it. Brooklyn Flea – Who doesn’t love this bazaar of awesomeness? Go grab something food that smells and looks inedible, but tastes like heaven. While you’re at it how about a wheelbarrow for that hip wall art you always wanted. The toasty indoor location, 80 North 5 St. (at Wythe Ave.), is open Saturday and Sunday from 10am-7pm. 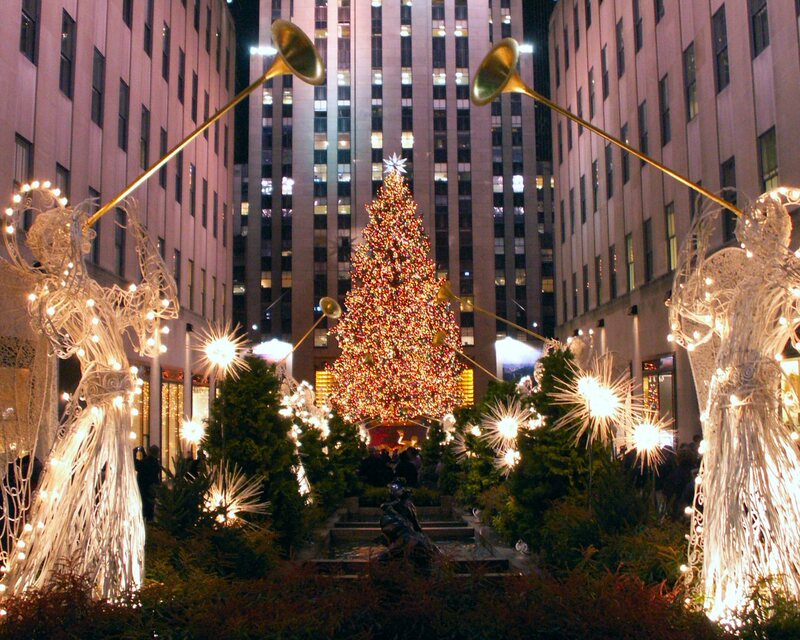 Tonight we will all live in complete harmony gazing upon the triumph that is the 2013 Rockefeller Center Christmas Tree. Get down to Rockefella Center and see what all the hubbub is about. If you are attending any of these events we strongly suggest you book your parking through ParkWhiz.com. Your parking spot is hassle-free and guaranteed when you book with the us.